Please note that the content of this book primarily consists of articles available from Wikipedia or other free sources online. 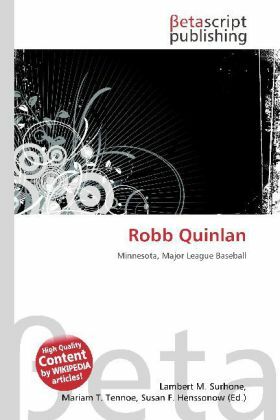 Robb William Quinlan (born March 17, 1977 in St. Paul, Minnesota) is a Major League Baseball utility player who is currently in the Los Angeles Angels of Anaheim organization. He plays first base, third base, corner outfield, and designated hitter. Quinlan''s older brother, Tom Quinlan, spent parts of four seasons in the major leagues with the Blue Jays, Phillies, and Twins. Quinlan attended Hill-Murray High School in Maplewood, Minnesota. At Hill-Murray High School he set the state and school record for consecutive time reaching base. In his junior year in 1994, Quinlan reached base 86 consecutive times, garnering praise from newspapers around the country. He was drafted by the California Angels in the 33rd round (900th overall) of the 1995 Major League Baseball Draft out of high school and was offered $50, but did not sign with them. Instead, Quinlan decided to attend the University of Minnesota and graduated from there in 1999, obtaining a degree in marketing and communications.